38 Old Deer Park Gardens, Richmond, TW9 2TL. 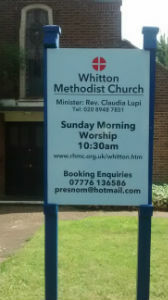 The church is on the corner of Percy Road and Ross Road in Whitton, TW2 6JL. Hall Lettings: contact Robin Gammon 07776 136586, presnom@hotmail.com. Allow 48 hours for a reply. Sunday Services: Sundays at 10.30am.